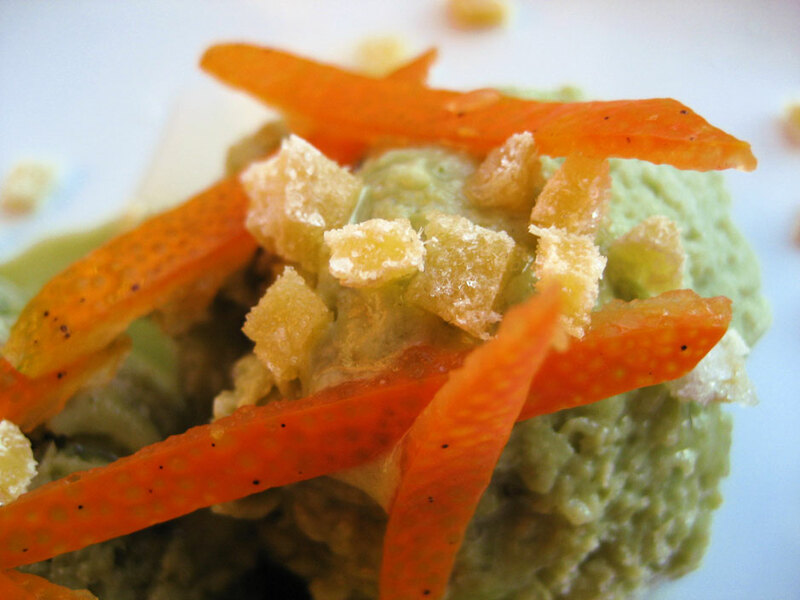 It almost looks healthy - look at all that green and those carrot-like shards of orange! Though I haven’t begun to make the other two things yet, they are my projects for the next couple of days. This, however, is something I made before I left on my trip. I just put the elements together yesterday after getting home from the store (to buy things that I needed to make the upcoming stuff). I like veggies, but this is good, too. 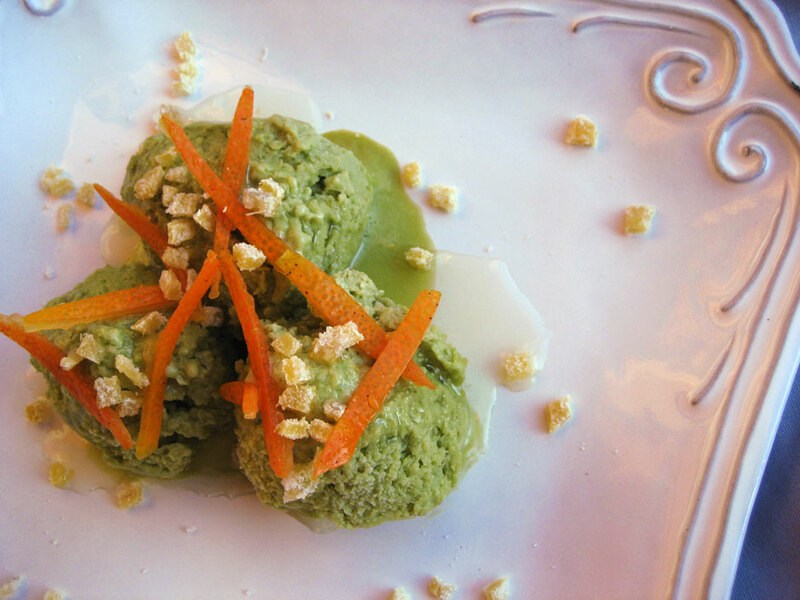 I know I said I wasn’t going to try making ice cream again until I could get an ice cream maker, but I had leftover egg yolks and just felt like playing with matcha. Zesty, yummy and dainty. No, really, those are small scoops. I also constantly have a small collection of flavored syrups in my fridge, since I really enjoy candying things. It’s fun! I actually candy ginger more for the ginger syrup than for the candied ginger itself now, though I do love hot, chewy little shards of candied ginger. So many things I love in one dessert! I’m always trying to come up with new ways to use the syrups – in marshmallows, drinks, I use ginger syrup to make a glaze/sauce for tofu stir fries…But I rarely use them straight-up. 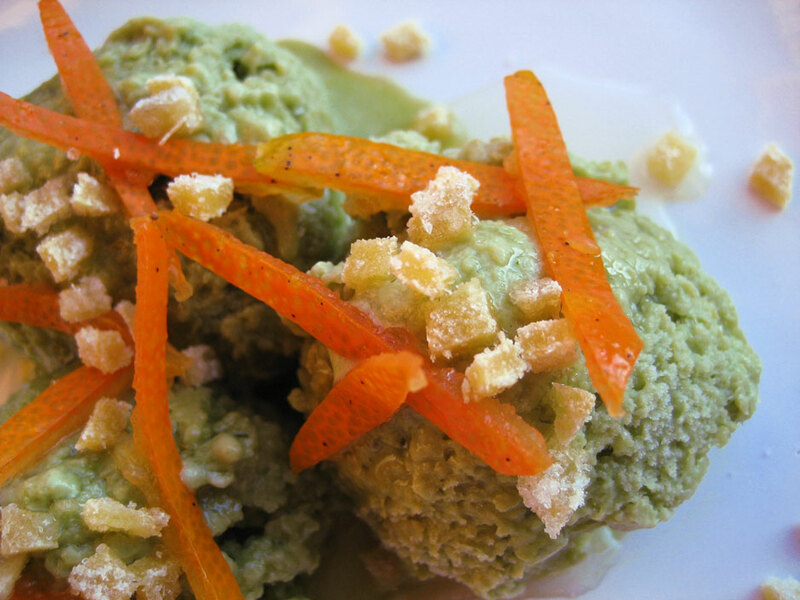 I happened to have both ginger and kumquat syrup on hand and knew they’d both go great with matcha ice cream, so I created this little sundae. Though the first time I made candied ginger I used Alton Brown’s method, I’ve used this one since, because it actually results in a ginger syrup as opposed to a ginger water that needs sugar boiled into it. I never posted the recipe for candied kumquats because I just didn’t really like them candied as much as fresh, which is kind of a shame because the syrup is incredibly good. It’s not bitter at all (which is good, considering it’s a flavored sugar syrup), and has an earthy, floral quality that is absolutely delicious. I don’t know if you’d get different results using whole as opposed to sliced kumquats, but I’d slice them so you can de-seed them. There’s a recipe for candied kumquats on this page, along with lots of other kumquat recipes. The simple candied ones I made are in the left column, almost all the way down. That's syrup, not water. The color in the syrup is hard to see in small quantities, but the flavor is definitely there. Heat the milk and cream in a medium saucepan over medium heat until small bubbles appear (do not allow it to boil). Immediately remove from heat and set aside. In a medium bowl, beat the yolks and gradually mix in the sugar and salt. Whisk for about 3 minutes, then slowly add the milk/cream mixture, whisking constantly. Return the mixture to the saucepan over low heat, stirring constantly for about 10 minutes until it is thickened. Remove from heat and set aside. 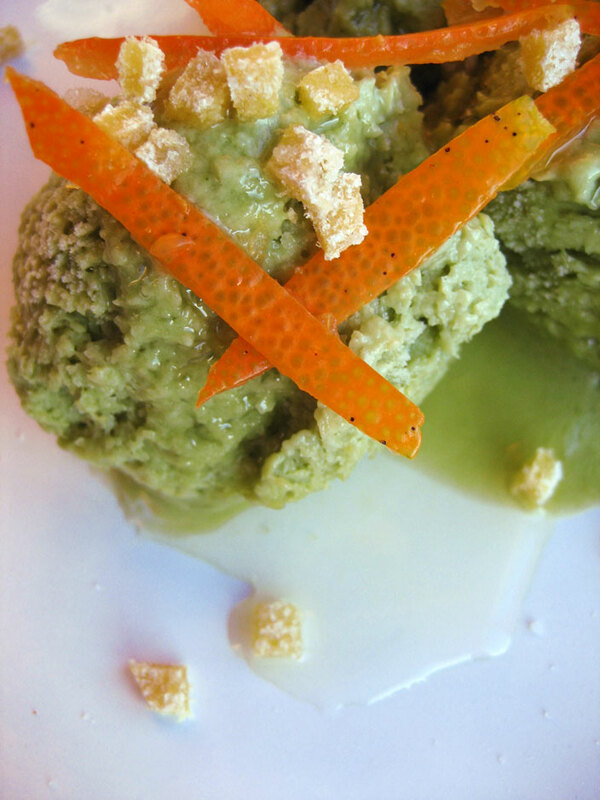 Whisk the matcha into the hot water until dissolved, then pour it into the custard and whisk until fully combined. Pour the custard through a sieve into a large bowl, cover with a kitchen towel and allow to cool to room temperature. Once it’s fully cooled, pour into an ice cream maker or freezer-safe container. Follow ice cream maker directions, or if not using a machine, stir thoroughly every 40 minutes until evenly frozen and scoopable. Arrange the ice cream scoops onto a chilled plate, drizzle with syrups. 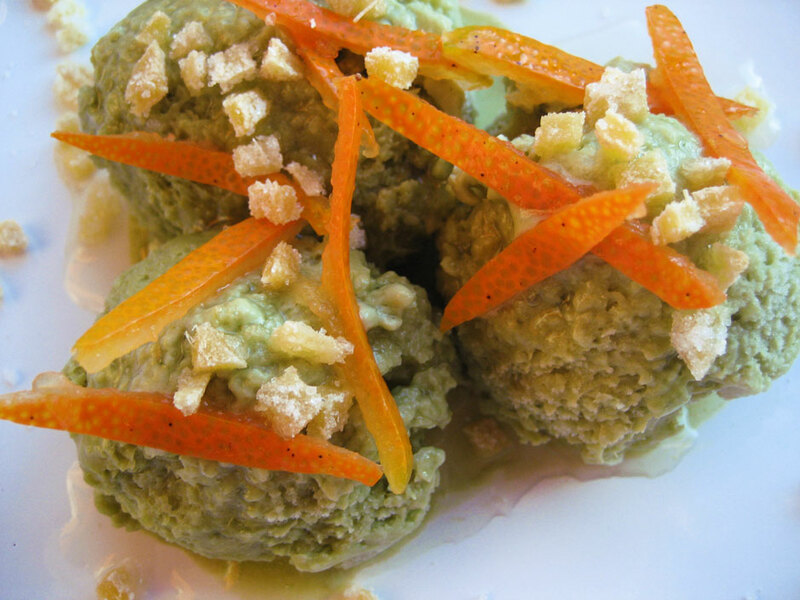 Arrange the kumquat strips on top of the ice cream and sprinkle with chopped candied ginger. This will definitely wake up your tastebuds! The matcha provides a mild, earthy backdrop for the flowery kumquat syrup and zesty ginger, and the fresh kumquat provides a nice sour contrast. I want an ice cream maker more than anything now, because though the ice cream turned out tasty (Z ate half the container when I was out the day after I made it), the ice crystals are way too big and the ice cream doesn’t come out as creamy as it should without the proper equipment. I can eat candied ginger straight out of the bag. I’m a total ginger fiend. I’ve never made my own candied ginger, though. But you inspire me to give it the ol’ college try one of these days.